Moving your top leg while maintaining the strength and stability of your torso and bottom leg is only one of the challenges of the Side Kicks! I absolutely love the Side Kick series! 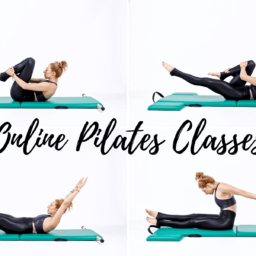 Pilates is one of the few workout regimens that incorporates the side body. And, while it looks like you are simply working the top leg there is so much more to this exercise! The bottom leg outer hip muscles are kicking on to help anchor you. The obliques are supporting the spine and the upper back in connecting to help stabilize. Originally, the Side Kicks was just the Forward and Back variation. Over time the up/down, little circles and big circles have been added in. There are endless other variations out there now. If you maintain the stability and opposition of the Side Kicks, you can do any variation you need for your body. Press down to stand on your bottom leg without locking your knee! Line your body up with the back edge of your mat. If you have a moon box, place both feet on the moon box. If you do not have a moon box, place both feet in front of your mat. Prop your head into your bottom hand and place your top hand in front of you on the mat if you are newer to this exercise or behind your head if you are more advanced. Lengthen your spine by reaching the crown of your head in one direction and your feet in the other direction. You may feel your bottom waist lift off your mat slightly. Lift your top leg up and reach it longer than your bottom leg. Take your leg as far forward as you can without changing your torso and then bring it part way back and then kick again. Then press the leg back as far as you can and then slightly forward and then back again! The teaching cue is usually heard "kick-kick, back-back." As my leg goes back I like to open my chest more, the body tends to cheat itself and round here or lean forward. After the front back, you can turn your leg out and go "up-up" and then hug the leg down! And, if that is still going well, take the leg back and do little circles in each direction and then big circles in both directions! Flip over and switch sides!